FQB "Fireside Christmas" Collection brings you to that place of warmth and solitude that the Christmas Season draws into your days. Warmth from a fire, your favorite comfy chair, presents under the beautifully decorated tree....close your eyes and imagine it! 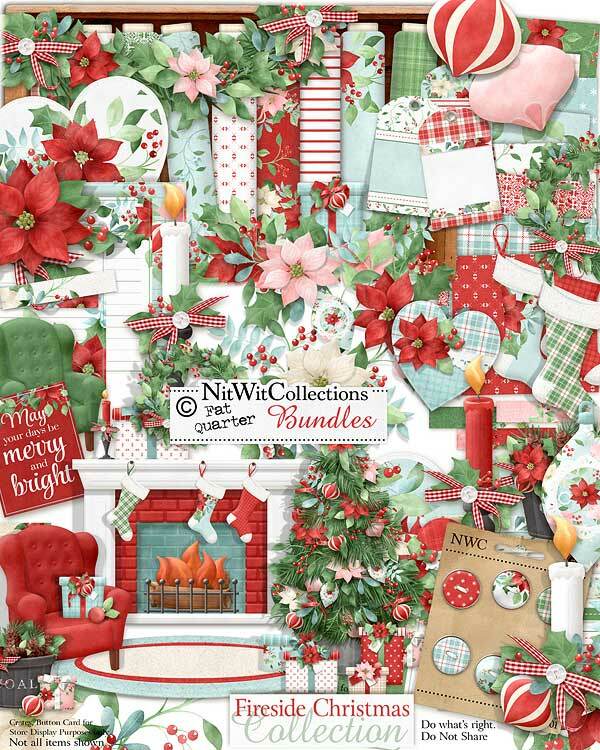 This quintessential Christmas digital kit will give your scrapbooking layouts, cards and mini albums so many different options that it will be hard to choose where to start. Classic Christmas colours for a classic Christmas kit....what could be better?! 4 Arm chairs to rest and relax in...2 have presents just waiting for you, and two are empty to give you a little more room to get comfy! 1 Christmas tree already decorated right out of the box!! 1 Coal bucket...I gave the coal to LG and filled the bucket with pinecones for you! 1 Journal card - "May your days be Merry and Bright"
6 Presents....can you believe it....six presents all for you!! I guess Santa was good to you! 3 Tags - use them as accompanying elements to beautify your cards, mini albums and scrapbook layouts or perhaps even print them and use them as gift tags!